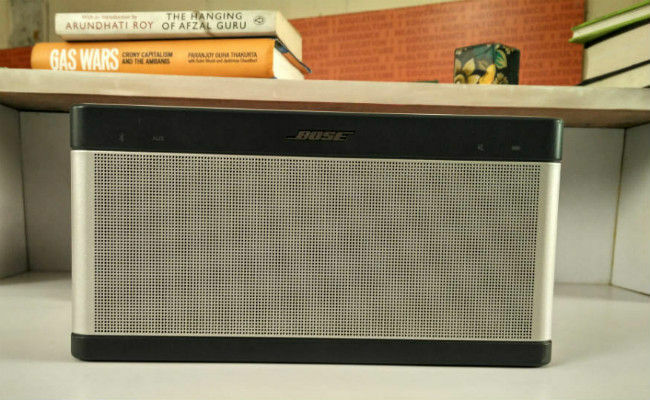 The Bose Soundlink III expects a sizeable amount of money for a portable Bluetooth speaker. There are options that offer much more value for money but if money is not a concern, then the Bose Soundlink III won’t let you down. Out of all the audio brands in the market, Bose probably has an enviable position. Not only does it have a sizeable grip on the premium audio gear market, but it’s also a brand name that holds considerable sway as one associated with premium audio (as much as audiophiles may object). Even though Bose does project itself as a company that delivers products with great audio quality and compact footprint, the main reason why Bose products haven’t exactly set the Indian market on fire is their prohibitive pricing which sets them way out of reach for the normal consumer. The bad news is that the Soundlink III isn’t a product that marks a shift in Bose’s strategy, so if are looking for an affordable Bluetooth speaker, this isn’t it. Instead of wasting your time reading this review, you should head on over to our story on the best Bluetooth speakers under Rs. 5,000. If you have the money to spend and are looking for a Bluetooth speaker to buy, you’d do well to consider the Bose Soundlink III. Why? Read on. Remember those classy looking transistor radios from the ‘80s? Well, the Soundlink III emulates that design, just like its predecessors, and ends up looking understated and utilitarian. It forsakes the showy design and colours that most of its peers adopt but you won’t be out of line if you think it looks a little drab. There’s not really much about the Soundlink III’s design that stands out; all its elements are purely functional and I can’t fault Bose for taking that road. The Soundlink III is a big block, shaped like a brick, and at 1.3 kgs, it’s relatively heavy as well. You will think twice before lugging it around, especially if you already have a laptop in your knapsack, although it should fit in. Except for its top panel, the Soundlink III’s body is completely made of plastic but it’s still very solidly built. Its front is primarily occupied by the light grey speaker grill flanked on top by a slice of darker grey plastic that holds the status lights for Bluetooth, aux connectivity, mute mode and battery, along with the Bose logo. 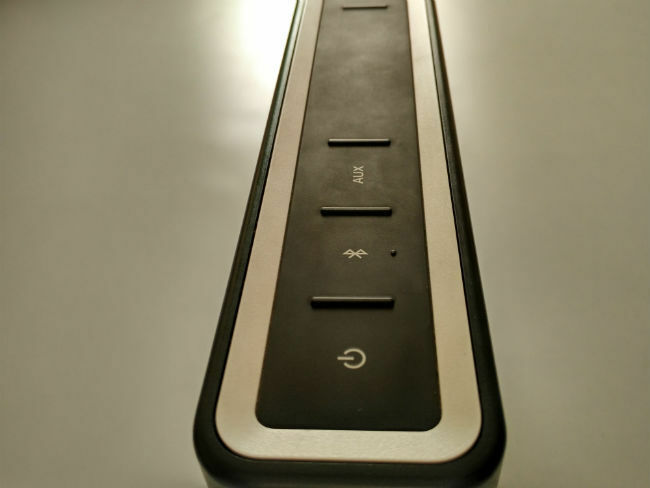 The speaker’s top is a rubber panel that has the buttons for power, Bluetooth, aux connectivity, mute and volume. These buttons are actually hidden under the panel and you need to press down on the printed icons to get tactile feedback. The buttons are responsive and are conducive to blind usage thanks to the raised rubber lines that separate each of them. 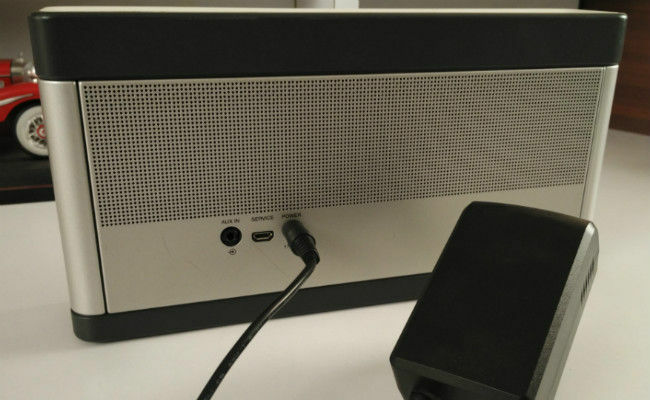 The back also has the speaker grill, which hides the primary bass driver, below which are the 3.5mm aux, microUSB and power ports. There is a noticeable absence of a mic pinhole since the Soundlink III doesn’t actually function as a speakerphone. This means that even if you have your phone paired to the Soundlink III over Bluetooth, you will have to take calls in the normal fashion. Considering that many less expensive Bluetooth speakers that we’ve reviewed offer that feature, it’s surprising that the Soundlink III doesn’t. Overall, the Bose Soundlink III is well-built and has a very business-like design that’s all about functionality and utility. If your experience with Bluetooth speakers so far has been limited to those that output audio with no real power, and compromise on ‘room-filling’ ability to cater to portability, then the Bose Soundlink III will surprise you. This is a loud speaker, in fact, one of the loudest that I’ve reviewed, and it stands right alongside the much larger House of Marley Get Up Stand Up. I placed the Soundlink III in a hall that measured almost 1000 square feet and it was loud enough to drown out any other sound. Granted at peak volume, the audio quality does drop by a discernable degree but there was little distortion to speak of. When you start playing music over the Soundlink III, the adjectives you’d use to describe the sound quality are “warm” and “rich”. The speaker has a definite bias towards the lower-end of the spectrum but unlike many other similar speakers, it manages to combine punch and expansiveness. In Kanye West’s Monster, which has a strong continuous 90 bpm bass tempo , the Soundlink III holds its own and gives the rap verses a degree of breathing room. In a more club oriented track like Darude’s Sandstorm, the Soundlink III’s bass punch does fall a bit short but that’s only because it’s a portable speaker, after all. When it comes to acoustic tracks, I found that although the vocals were clear and distinct, the instruments tended to disappear into the mix. For instance, in First Aid Kit’s King of the World, the guitars, horns and maracas sounded cramped while the vocals, both solo and harmonized, floated above. However, Jack Johnson’s Banana Pancakes, is aided by the fact that the mix only has vocals, a bass guitar and an acoustic guitar. The Soundlink III isn’t great at reproducing the sparkling highs of cymbals either, as showcased by Miles Davis’ Freddie Freeloader, in which the cymbals come across as flat and slightly lifeless. When it comes to genres like metal and rock in which songs tend to have many instruments in the mix along with the vocals, all of which demand focus, the Soundlink III falters. While the bassline and the primary vocals stand apart, the vocal harmonies and guitars get drowned in the mix. In The Black Keys’ Lonely Boy, the guitar riffs were almost inaudible when the Soundlink III was set to about 40% volume. Similarly, Mastodon’s The Czar has quite a bit of cymbal-work and guitar plucking, and both elements get lost among the chugging riffs and multiple instruments. To sum it up, the Bose Soundlink III is a very loud speaker that does justice to music with a bass focus and limited instruments but has some problems when it comes to other genres. The Bose Soundlink III has an internal battery that’s claimed to be able to run for “up to 14 hours”. The Soundlink III surpassed that figure during my review and was able to last for 15 hours before switching off automatically. The Bose Soundlink III is listed at an official price of Rs. 22,400 and that’s a sizeable amount of money to put down on a portable Bluetooth speaker. There’s no denying that the Soundlink III is a quality product with impressive performance but there’s also no way to ignore that price-tag, not with the usual refrain of “oh, but Bose products are always expensive.” If you don’t want to spend as much and are okay with a slight dip in power, look at the excellent Creative Sound Blaster Roar. Or, if you have the means to get products shipped to you from abroad, and want something much more portable, consider the Logitech UE Boom. If money is not a concern, then the Bose Soundlink III won’t let you down. I am buying a phone suggest me.